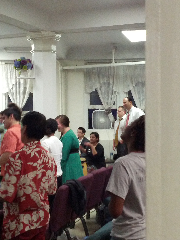 Though we are currently on deputation, God is moving in Fiji! This is just a brief partial update of the many wonders Jesus is doing among His people. Since we began deputation in May, 3 new churches have been started and in one village the chief donated land for a new church to be built as his tithe. It is often difficult to start a new church in Fiji, and there is frequently violent opposition in some areas; thus, this is a great and wonderful thing! Brother Goodare from Christchurch, NZ brought a missions team to minister throughout Fiji in July. During their time there, God moved mightily. There were 42 new people who received the Holy Ghost for the very first time! 15 People were baptized in Jesus name! There were 6 notable healings and miracles preformed. One paralyzed man was baptized and immediately healed. His back was recovered, and his limbs were restored to being able to have feeling. 2 month old William was dead for over 20 minutes and being taken to the mortuary. Neither mom or dad were in church, but other family members began to pray. God brought baby William back to life as a testimony to both mom and dad. Now, both parents have been baptized in Jesus name and have received the gift of the Holy Ghost. God knows how to get people to repent and be born into the kingdom; we simply have to ask and believe! Our First Deputation Service God Met a Huge Need! To reach 110 populated islands, a reliable boat is a good thing to have! We were with Brother Jerry Dean of Jacksonville, FL for our very first official deputation service. After service we went for ice cream, and Brother Dean mentioned a friend that had a boat for sale. Bro Dean called Brother Don Rush in West Palm Beach, FL and told him that a missionary was interested in his boat. Brother Rush told Brother Dean, “for the missionary I will sell it to him for 1/2 of what I am asking, $5000.” We then called Brother Rush to find out about the boat, then looked it up online to see if it was really what we needed. Brother Rush called back within 5 minutes of our last conversation and said, “Brother, I just talked with my wife and we are just going to give you that boat.” In Fiji, this is a $70,000 USD boat! We would like to say thank you to all of our supporters! Without you, it would not even be possible for us to attempt to do the work of God. We truly appreciate those of you that are faithfully giving to the work, and especially those that are faithfully praying for the work in Fiji! We have many new personal supporters, church supporters, and even youth group supporters! Truck Issues...And God Provides via His Church! We love our 2001 Ford F250 even though it now has 295,000 miles on it. God blessed us with it in 2008 for $4000 out of our pocket. Up until we started deputation, we have not had many problems with this truck. Since we started deputation, it has become a challenge...We have replaced the clutch, the alternator, the accelerator pedal, the camper power outlet, 2 tires on the truck and the back brakes. The camper has had the shower repaired, 2 tires, and the power cord that attaches to the truck all replaced. We also had an accident, fortunately on a parking lot, that damaged one side of our camper and we lost several lights. But God has been good, we have always been in the right place at the right time for something to go wrong. When our clutch went out, Brother Braneff in Crestview, Fl. loaned us his van to continue on our schedule, as well as took very good care of us! When our alternator died, I was rescued by the Bible World guys and used Pastor Cunningham’s battery to get my truck home. When the accelerator pedal quit, my father-in-law helped my 15 year old son learn to change the part. When our brakes went bad (we had no idea they were in trouble), Bother Calhoun in Fredericton, New Brunswick, Canada stepped in and saved the day. Bro Calhoun arranged for someone to fix the brakes, which turned into rotors, calipers and seals. The brakes were at the point of failure, and we had no idea. Not only that, but he arranged for the Fredericton Church to pay for it all. Mitchell and Gerri Fox began in missions in 2002 as part of the "Maxwell Team" lead by Pastor Daniel and Kay Maxwell of Calvary New Life Tabernacle in Gerald, MO. Jesus worked miraculously in their lives and provided a menas for them to be able to help build Bible schools in Vanuatu, Papua New Guinea, and the Solomon Islands. They have actively served in various leadership positions in the church: Men's Ministries, Audio/Visual Ministries, Ladies' Ministries, Sunday school teachers, ACE model school supervisor, teaching home Bible studies, outreach and preaching. They have been blessed by being able to help with several Church-in-a-Day projects in Missouri, South Dakota, and Virginia. With a burden for missions, the Foxes received approval as AIMers to Fiji in 2007. In 2008 the Foxes moved to Babytown, Texas with Pastor W. L. Atchinson. They were privileged to expand their ministering with a broader cultural and population base. Sister Fox was able to learn many facets of church finance and administration as the church secretary for Harvest Temple and Temple de Fe. She also started a bus ministry, taught Sunday school, and helped in the youth ministry. Brother Fox concentrated on outreach, bus ministry, preaching, home Bible studies, and teaching the ACTS class while in Texas. They both attended Soul Winners Boot Camp and helped in Galveston, TX with a blessing the community event with Bro. Tim Downs. In late 2009, the Foxes began traveling with their jobs at nuclear facilities, which has taken them all over the country. They have been blessed by being able to attend church with some of the greatest people in the UPCI. Working with a variety of Pastors, Ministers, and Evangelists broadened their view of ministry. In 2010, the Foxes, as a family, served three months in Fiji on AIM. They taught in the Bible school, spoke at different churches each week, spoke at several district events, and helped with the cultivation of the church farm. During their ministering many were baptized and received the Holy Ghost. The time was well spent in assimilating their children for a future lifetime of ministry in an unknown culture. During that short time, their daughter broke her clavicle; their son severely cut his foot; and Brother Fox contracted typhoid. Each trial they faces allowed them to see the reality of living in a different country. The rewards outweighed difficulty, and the Foxes proceeded to apply for full time appointment. In 2011, the Fox's decided to only work in Virginia and make Bible World in Chesapeake, VA their home under Pastor Jack Cunningham. Since being in VA, the Foxes have worked in Children's evangelism, outreach, and have reaped from the ministers training provided by the leadership. Each step the Foxes have taken has prepared them to be effective in ministry, both at home and abroad. In March 2012 the Foxes received their first appointment as intermediate missionaries to Fiji. When the Foxes arrive back in Fiji, they will be in the capitol city of Suva. They will teach in the Bible School and follow the direction of the National work in Fiji; minister throughout the islands, 110 populated, as the opportunities arise; and encourage the brethren to spread the gospel of Jesus Christ. They are also hoping to start a campus ministry at the University of the South Pacific to reach the surrounding island nations. And with Jesus on their side, all these things will be accomplished and many greater things to the glory of God. We were so blessed to worship with Bro. Staten and his congregation tonight. We were reminded that Jesus must be the Lord of our life. Over 100 European campers & staff came from Germany, Austria, Liechtenstein, Switzerland, Great Britain, Netherlands & Spain to fellowship, worship & grow together. God ﬁlled 5 campers with the Holy Ghost, all were reﬁlled, a ﬁre for revival was caught and local churches were strengthened! Thank you Pastor Negron (Youth President) and your team for organizing an apostolic camp meeting! Over 74 young people came from North America to Switzerland & Liechtenstein to help us evangelize, reap a harvest and open up a new city in the nation of Switzerland. What an incredible impact they made! We are still reaping the harvest in all of these cities! Thank you Bro. Mann (UPCI General Youth President), Bro. Sayers (UPCGSN Missions Director, youth from Vienna & youth from the USA for giving a season of your life to sowing & reaping in Europe! You were such a blessing! JULY 2012-FILLED WITH THE BLESSING OF GOD! 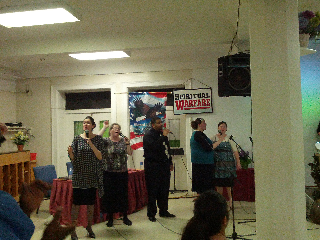 APOSTOLIC REVIVAL! 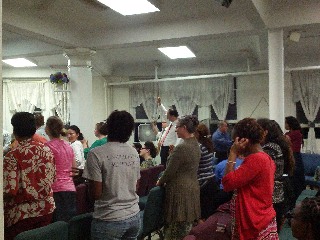 Another ﬁlled with the Holy Ghost! Woman receiving the Holy Ghost! In the month of July, God ﬁlled at least 130 with the Holy Ghost, 35 were baptized in Jesus name, we were blessed with at least 17 new partners, $2,900 was given towards our project needs and there were at least 20 people who testiﬁed of miracles & healings in services. We are so thankful for every pastor & church that allowed us to come and minister, blessed us so abundantly and continues to pray for our family & the UPC GSN! REVIVAL IS OURS! July 10-20 we opened the doors to our full time ministry training center in Landstuhl, Germany! It was so wonderful to see the hand of God mightily upon every instructor & student that walked through the doors. We were blessed with many North American Pastors/leaders (Bro. Stark, Sis. Heidi Stark, Bro. Rubio, Bro. Bounds, Bro. McEndarfer, Bro. Bonivillian, Bro. Byers, Bro. Stovall, Bro. Showalter) who linked arms with our UPC GSN brethren (Bro. Sayers, Bro. Negron, Bro. Denk & Bro. Tonkowik) to teach, preach & impart to a new generation of national leaders in the German speaking nations! During those 10 days, about 30 people were ﬁlled with the Holy Ghost as our students evangelized the streets and our North American guest preached in the local churches in the UPC GSN! There is no shortcut to continued revival in any city or nation, it only comes through prayer & investing in training up a new generation! We are so thankful for the GATS program and for every pastor that participated in this years ministry training! We will never be the same! THANK YOU! 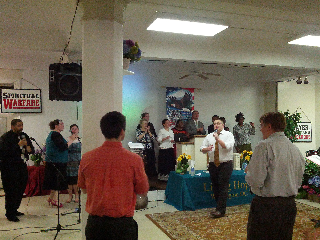 What a revival we had with the Dillon family & Carney family! In Madison God ﬁlled about 50 with the Holy Ghost including about 24 Methodist & Baptist campers who attended a Wednesday night service in their church & about 15 were baptized in Jesus name! 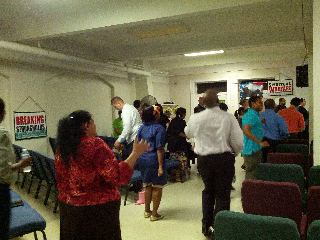 In Columbia God ﬁlled another 20 with the Holy Ghost! We were so blessed to be with these churches & Pastors. We are so thankful for their hospitality, kindness & friendship! EVERYONE CAN’T GO... BUT EVERYONE CAN GIVE.... MAKE A FINANCIAL SACRIFICE AND SAVE A SOUL! JOIN OUR TEAM TODAY.....SEND US TO CONTINUE REACHING THE GERMAN SPEAKING NATIONS! If you are not already a monthly partner with us, help us raise 45 more $25.00 PIM’s. Help plant 100 churches in the next 10 years in the German speaking nations. This July, I received an invitation from 80-year-old Rev. K’Ma to return to DaLat, Vietnam, to teach his church about water baptism in Jesus’ name! This resulted in 51 of his people being baptized! Many more baptisms are scheduled to follow in DaLat, Nha Trang, and Cam Ranh Bay! K’Ma and his daughter K-Mon were baptized after I taught them in 1994 (See above). Two years ago, several of Rev. K’Ma K’ma’s grandchildren were baptized during a seminar we held in HCMC, hosted by POA. He and his wife have 16 children and over 100 in their family. Pastors Vo and Duong (above) are also my converts from the early 90s that we are working with today. Three of the pastors pictured above have recently passed away. Pictured below on the left side and middle is a man we call Daniel. He is another convert of mine from 1994. I was reunited with him two and a half years ago. Today, he is working with the other missionaries from the UPC while he builds a church in HCMC. The picture on the bottom right is the group I baptized in Dalat the ﬁrst week in August 2012. Please keep us in your prayers as we endeavor to relocate other important contacts from the early 90s. I sit here at my desk at school and reflect on how long ago my home visit seems. I know it was not that long ago, but I have to remind myself a little that is only (already!) the beginning of September. I am so glad to have been able to see a good number of you and look forward to the possibility of seeing more of you during my next visit--timeline uncertain. I thoroughly enjoyed all the conversations and laughs with each of you. I cannot fully express my delight at those moments we spent worshiping, growing, and praying together. I gained such strength from my time with you and would have you know it. Thank you! A point of excitement for me: At church, I am able to sing along with more and more of the songs. I still become incredibly excited when I recognize a song, as in I know it well enough to sing it in English in my head. I may confuse the people around around me a bit with my language jumping in the middle of the songs...in the middle of sentences. It is quite fun, actually. The Sunday school children are doing well in their lessons, and I only have experienced one fun lost in translation moment as yet. Be in prayer for all these children; I so want them to know how to pray, really pray. It is my prayer for the young people as well, my dear Gwangmyeong friends. As to my official job as teacher, I enjoy the students and my coworkers at my middle school in the middle of the city in the middle of Korea. I am certain of God's hand in bringing me to this place and amongst this people. Pray that I have wisdom as I continue to impact their lives--and they mine. School news: We have a new principal. It is his first year as a principal at a middle school. Remember him, too, in your prayers.